Deepthi Perera, former Chairman, CIFL (Central Investment and Finance Ltd) on the run overseas for the past two years, was arrested on Monday after arriving with a bogus passport amidst objections by depositors of the failed company to any restricting plan. Depositors also threatened to surround the homes in protest of officials including former Central Bank Governor Ajitjh Nivard Cabraal whom they held responsible for the fiasco, if all efforts to recover their money failed. Said to be hiding in Cambodia after allegedly defrauding depositors, the sought-after suspect was nabbed at the airport and produced in court the next day. But his appearance on the eve of elections triggered suspicion that he may have struck a deal with the government. He had promised to submit a repayment plan in court but when the case came up again on Friday before Colombo Chief Magistrate Gihan Pilapitiya, he failed to do so. The Magistrate allowed the parties involved – CIFL Depositors Association (CIFLDA), the CID and officials of the Central Bank and Mr Perera to discuss the matter and report back to the Magistrate. 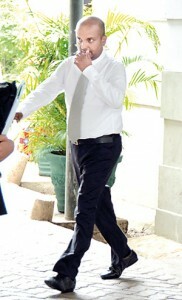 However at the discussion Mr. Perera changed his position and said he would prepare a Restructuring Plan. The case was then postponed to September 26. Earlier on Thursday, the CIFLDA held its’ AGM at the Public Library where the office bearers including its President, K. W. Gunawardena were re-elected.The membership vowed to press for repayment of their deposit money and was not willing to accept any other plan. Mr. Gunawardena said that if all the options of getting their money back failed, they would go to court, for which the membership agreed. While their stance is strictly for repayment, they said however that any other plan would be thoroughly scrutinised. On the invitation of the CIFLDA, three CIFL directors –Lakshman Rupasinghe, P.V. Pathirana and Samantha Nandasena arrived at the meeting. Mr. Rupasinghe explained how the things led to present stage. During his a explanation number of depositors started firing query after query. One said ‘Oya baila gahanne, Oyagolloth me horakang walata sambandai (This is nonsense, you are also involved in these frauds)”. In the meantime, Prasanna Solangaarachchi, one of the UPFA candidates contesting tomorrow election rushed on to the stage and made a speech assuring support to the depositors.